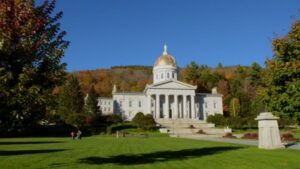 Vermont Businesses for Social Responsibility is proud to represent our members at the Vermont State House during the 2019 legislative session. Our goal is to pass laws and regulations that support triple-bottom line businesses in Vermont and foster an economy that supports our businesses, environment, and communities. Supporting the development of good-paying jobs by raising the state’s minimum wage and establishing a paid family leave system. Decarbonize our economy and harness the power of the clean energy sector to create new jobs and businesses. Protect our natural resources, including our lakes and rivers, which are under threat from pollution and poorly-planned development. Pass policies that support small businesses and workers, such as expanding access to child care services, affordable housing, and public and alternative forms of transportation. Read VBSR’s full 2019 legislative agenda. VBSR is always looking to connect our members with their elected officials in Montpelier and help them engage in campaigns that support their businesses. Please contact VBSR Public Policy Manager Daniel Barlow at danielb@vbsr.org to learn more.